On 18 January the Eastern European Studies Centre and Belarus Research Council organised a panel “What Belarusians Think?”. The participants discussed the results of the December social survey conducted by the Independent Institute for Socio-Economic and Political Studies. Professor Oleg Manaev, director of the IISEPS, presented and analysed the polls. He underlined the importance of presentation of the results abroad since deteriorating situation for freedom of speech in Belarus. Other panellists Alexei Pikulik, an analyst of the Belarus Institute for Strategic Studies, and Sergey Nikoluk from IISEPS, continued on commenting the survey outcomes. Valery Karbalevich, a journalist of Radio Free Europe/Radio Svoboda, moderated the discussion. The discussants focused on the reasons for stabilisation of Lukashenka's rating although the pools proved dissatisfaction with the deteriorating economy. They also took a closer look into low social trust for the opposition. Below is a summary of the main issues discussed. The December poll conducted by the Independent Institute of Socio-Economic and Political Studies (IISEPS) shows that the personal rating of Lukashenka is actually "frozen". In December, 39.1% respondents trusted him, while 49.1% did not trust (in September – 38.5% vs.51.9%). Also, the president is considered as the main culprit of the current economic crisis (41%), followed by the government (39.1%), the opposition (11.5%), Europe (10.9%), Russia (7.5%). The polls also showed that the year 2012 appeared to be very difficult for Belarusians. Despite the salary growth, 57 per cent of respondents claimed that their material situation has not changed (vs. 27% of those who claimed that it deteriorated). 88 per cent of respondents think that Belarusian economy is in crisis. Almost half of Belarusians blamed the president for the current economic crisis (41%). However, it is less that in the previous survey (almost 50 per cent). 39 per cent of Belarusians put responsibility on the authorities. Whereas respondents remained critical toward Aleksandr Lukashenka, many of them have expected him to overcome the economic crisis. Number of Belarusians who understand that the socio-economic model in Belarus is no longer viable has increased (33 per cent now). Almost 30% of respondents claimed that its ‘success’ depended upon substantial financial aid from Russia. Is That Really so Simple: Russia Closer, the EU Further? Cultural closeness of Belarusians and Russians remains one of the key factors of the Euro scepticism in the society. Moreover, the idea of similar mindset determines often the geopolitical identity of Belarusians. For example, it encourages to integration with their Eastern neighbours, even at the level of daily life situations, such as at work, entering into mixed marriages. Changes are possible but only as long-term process. As the data showed, the number of proponents for the integration with Russia remains rather stable (38 per cent). Similarly, there are no dynamics in the attitude toward the idea of joining the European Union (43%). However, 25 per cent of Belarusians have heard about the European Dialogue on Modernisation. Almost a half of respondents think that the initiative is important for Belarus. It means that the society is obtaining information on that project and expresses its interest in it. Belarusians expressed positive attitude toward small cross-border movement (50% in favour of it). In particular, people living in the borderland regions remained positive for that initiative (for example, 72 per cent of Grodna’ s respondents). Asked for the reasons of problems with implementation of the agreement with Poland and Lithuania, 28 per cent respondents argued that it was due to the Belarusian side. 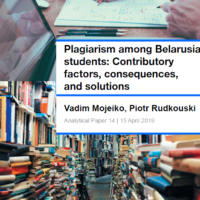 Only 13% Belarusians put responsibility on Poles and Lithuanians. It can mean that the society understands the political motives staying behind the Lukashenka’s strategy. According to the discussants, it is the civic initiatives that could take more active part in the process. The rating of Lukashenka remains stable (31.5%), but with a slight decrease from 34.5 per cent in September 2012. Interestingly, over 40 per cent of respondents did not express support to any of the listed politicians. It means that still a substantial part of society remains undecided. The panellists disagrees on how Belarusians perceived the opposition. One of the speakers suggested that the society does not understand the idea of the political party and its formalised structure. It is thus unsatisfied with the opposition activity. On the other hand, many Belarusians associate the opposition with the concrete political force. Moreover, support for a certain political party means affiliation to it. Therefore, they remain sceptic about expressing their positive attitude. The low support for the opposition has also other reasons. According to one speaker, the opposition has already showed its weakness and inability to exist in the state system. It is also due to the quality of the regime which efficiently hinders its functioning. For example, the opposition is not present in the information space. Another key issue is that the Lukashenka’s socio-economic project worked out for many years in Belarus. Thus, the opposition claiming the transformation to the market economy have not yet obtained substantial social trust and acceptance for its vision. It appears that for the Belarusian public opinion the opposition appears as eccentric and focusing on abstract disputes. On the other hand, as he noticed, the opposition weakness is also due to the regime. Different opposition would meant different regime. Panellists also paid attention to the role of Belarusian language in the public sphere. Many among the opposition claim that presence of the language is necessary for development the Belarusian national project. According to some opinions, the wider usage of Belarusian could foster the national awareness and as a result, it would also have impact on the regime. Such attitude failed to obtaine much support among the discussants. Indeed, it is the Russian language which prevails in the daily life usage (around 55-60 per cent of respondents in the last 18 years). The survey results proved that Belarusians recognised that the country’s economic and their private material situation deteriorated. Although many of them still hold Lukashenka’s responsible for that, at the same time they perceive him as the one who can manage to improve it. The December polls showed that Belarusians remain sceptical about the state institutions. The leader among the organisations of the highest social trust is the Orthodox Church (over 70 per cent). The respondents put their trust respectively in the army (53%) and advocacy (48%). 20% of people trust the oppositional political parties which is almost twice less as number of those who indicated the president (39 per cent). With lack of the social trust, the opposition stacks in its position. Alexander Lukashenka's annual press conferences involve more than just answering questions. Being passionate and open, Alexander Lukashenka’s unprepared speech can be very entertaining. His press conference last week was no exception. For most people in Belarus listening to the ruler’s press conferences is merely entertainment. Belarusians seem to forget that politics matters, that normal presidential speeches are not always accompanied by laughter and that serious problems facing the country require serious decisions. But for now fun prevails. Here is an overview of the most remarkable funny moments of the event. The last press conference, which lasted almost five hours, contained more than enough funny answers and remarks. "There are some [businessmen] who do not understand that it is necessary to give a little bit to people so that they live well. We will turn them a little towards people, the ones who like to glance in others’ pockets, we will put them in their place – that's the state-private partnership." "The National bank here is really independent, but at any time the President can demand a report from the National Bank, the president can check any situation which develops in the National Bank and demand some other action in the interests of our people." "And I can pose a number of questions to BATE [Belarusian football club] concerning their last games. When I turned on the TV and watched their matches with Spaniards, Germans and French after their brilliant games, I switched off the TV. It was shameful and offensive enough for tears." "We have been monitoring this situation. We approached queues [at currency exchange offices] – they were mostly pensioners, buying 10 dollars, 5 dollars. We asked, "Why?". They answered, "Just to have be some". "As for Asia, we have examined and explored this country for a long time." "The Ambassador of Russia is a very exotic person. <…> Sometimes the Ministries of Foreign Affairs and ambassadors know too little about what happens in the real relations between the states." "She [Hillary Clinton] said it one day, and the next day all the officials from the State Department started refuting, explaining she had not meant it. So maybe she blurted it out when she was hungover?" "When I walk around and I see an accordion – I have an accordion in each corner – I take it. But my fingers have got used to holding a hockey-stick." "I am almost a professional football-player by vocation." "Shushkevich [ex-speaker of the parliament] was razed to the ground when he arrived in some rumpled coat [to meet Bill Clinton at the airport – A.S.], maybe after some booze. It brought shame on the whole country." "Although I am a country guy, I have got used to my trousers being stroked and to a more or less decent suit." "Tomorrow President Lukashenka will be hanged, shot, will be dismissed – you will drive it." "I can sell my Maybach, will you buy it tomorrow? Tell me then, who will buy it?" "If you want to tell your president to go on foot or by the bicycle, it is fine, I can do it, but it will just be a shame for you." "Put on skies, skates. Here you are, today we'll sprint 10 kilometres, and if you come first you will be a president tomorrow." "If the income statement of any official interests you, tell me. I will show it to you, but you will also show yours to him." A.L. : If you are a participant of mass riots, you can’t complain. T.K. So, even if the person committed a crime, it is possible to treat him in contravention of the constitution and the law, as an animal? A.L. : On the contrary, we have no right to treat animals badly. "We in the government have no fights. Just look at [Vice-Premier] Siamashka. In one meeting he will tear your heart so that you recover only in two weeks." "Everybody thinks that if he [Chizh] plays hockey near the president, he can do everything. But nobody knows that he borrows money quite often." "In our country they won't put toilet paper into boiled sausages." "Why have you bombed Libya? Why have you bent Egypt? Why have you destroyed Iraq?" "Believe me, they walk around us today in packs and herds and gnash their teeth." "Even if Lukashenka cheated or deceived someone, which has never happened, he would do so in your interests, scoundrels [to oppositional politicians]."